Easy to follow gluten free chicken with mango rice recipe. Delicious sticky chicken served on a refreshing bed of mango rice with a wonderful mix of zesty flavours. A tasty blend of marmalade and mustard makes a sticky glaze for the chicken. Mango, spring onions, cumin and white wine vinegar make a great combination with the rice. 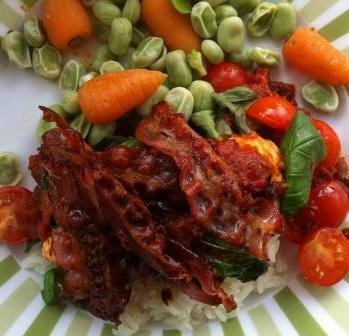 A gluten free chicken dish everyone will enjoy. 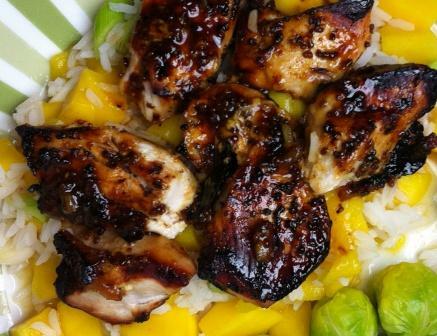 This gluten free chicken with mango rice recipe is one of the best gluten-free recipes for summer. Refreshing and light, what could be better on a warm summer evening. When making gluten-free recipes such as this gluten free chicken with mango rice recipe following a few simple rules will ensure your gluten free chicken stays gluten free, we have some easy to follow tips on our Avoiding Gluten page. This quantity makes four servings of gluten free chicken with mango rice. 1. Peel and dice the mango, toss with most of the spring onions, the cumin and white wine vinegar, then set aside. 2. Mix the marmalade and mustard together. Lay the chicken strips on a roasting tin and brush with half the marmalade glaze. 3. Cook the rice in bowling water (depending on the type of rice this will take around 12-15 minutes), drain when cooked. 4. While the rice is cooking, heat the grill to high. Grill the chicken for 4-5 minutes. Turn the chicken over and brush with remaining glaze. 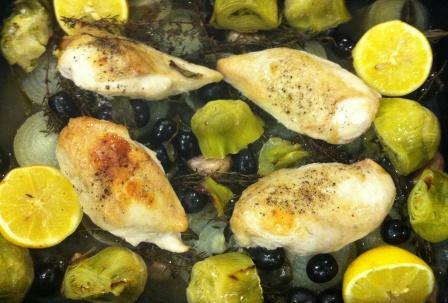 Grill for a further 4-5 minutes or until the chicken is cooked through and the glaze of bubbling. 5. Stir the mango mixture into the cooked rice. Place on your plates and top with the chicken strips and the remaining spring onions and serve hot.